Orchids come in dozens of types, but if a corsage flower comes to mind when you hear the word "orchid," you're thinking of a cattleya orchid (Cattleya spp.). Cattleyas make good houseplants, provided they're grown in the right environment, with warm temperatures and proper lighting. They can also grow outdoors year-round in U.S. Department of Agriculture plant hardiness zones 10 through 12, where winter temperatures stay above freezing. Cattleya flowers incorporate every color except blue, with two or more colors often combined together in a single flower. It's important to grow the plant in the proper temperatures for good health and flower development. The plant does best in daytime temperatures between 70 and 85 degrees Fahrenheit. A drop in temperature of 15 to 20 degrees at night is crucial to signal the plant to set flower buds, so nighttime temperatures should be 55 to 60 degrees. If you start with a young seedling cattleya, give it nighttime temperatures a bit higher, or about 60 to 65 degrees, to keep it growing fast. Once it's matured into a full-sized plant, drop its nighttime temperature to induce flowering. The cattleya orchid is an epiphyte, with roots that absorb water from air, so it's important to raise humidity in its vicinity to 50 to 80 percent. Mist the plant regularly with water, and place its pot on on a pebble-filled tray that holds water at a level just below the tops of the pebbles. If you grow the orchid in a greenhouse, use a humidifier to raise the air's moisture level. To prevent fungal growth caused by high humidity, run a fan on low speed near the plant to keep the air moving. Make sure the plant's pot has drainage holes in the bottom. A cattleya grows best when its potting mixture is allowed to dry between waterings. You can estimate when it's time to water by feeling the weight of the pot -- a dry pot feels quite light compared to one with mix that's still wet. The soil usually dries out five to seven days after the last watering. Do not use water below 50 degrees Fahrenheit, and don't use water that's been softened by adding salt -- substitute bottled water if necessary. 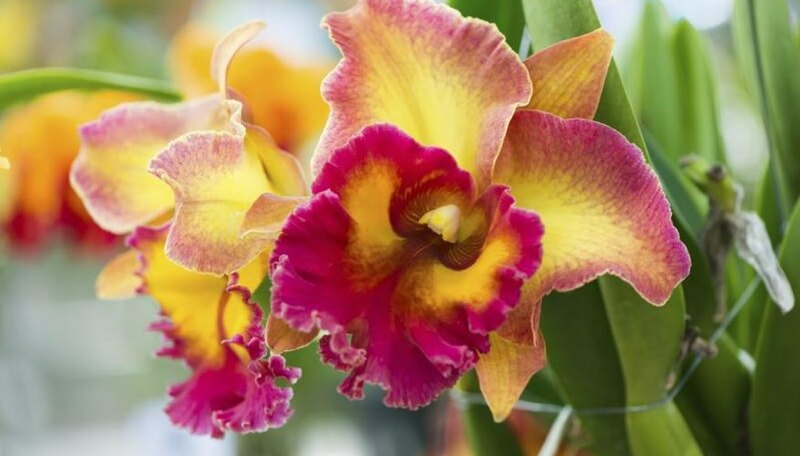 Sufficient light is also essential for good cattleya orchid flower production. The plant does best when it receives a bit of sun daily, provided it's not during the midday hours, which could scorch the leaves. Grow a houseplant on an east- or west-facing windowsill, or in a south-facing, lightly curtained window. In a greenhouse, give the plant about 50 to 70 percent full sun. You'll know the plant's getting enough light if the leaves are bright, medium green and it's pseudobulbs, the fleshy structures that give rise to leaves, stand erect without support. Dark green leaves indicate too little light, while yellow or yellow-green leaves indicate too much light. A cattleya needs regular feeding, especially when it's growing actively. If it's in a bark mixture, use a high-nitrogen, water-soluble formula such as 30-10-10; for other potting mixtures, use 20-20-20. Dilute the fertilizer at a rate of 1/4 teaspoon per gallon of water, but check your product label for additional directions. Feed the orchid every two weeks during spring and summer, cutting back to once monthly during cool weather when growth slows. Flush the pot with clear water every month to prevent buildup of fertilizer salts. Repot a cattleya when it's mixture becomes crumbly and breaks down, or when the plant's thick roots grow outside the pot. Use a coarse mixture containing fir bark that drains well, using a stick or pencil to tamp it down gently between the plant's roots in its new pot.